Lianas are also typical species of the tropical forest. They generally run through the forest, coming up from trunks and stretching from the top of a tree to another at amazing distances (up to 200 m) and with a diameter of 20 cm. They are variable in shape: some are straight, some are winding and often produce wonderful leaves and flowers. The lianas genus Clusia, for instance, have seeds that germinate high and let their roots fall down; as soon as these roots touch the ground, they grow and lignify. Lianas may stifle the plants on which they rest and even make them fall. Other bizarre plants of this ecosystem are the well-known “strangler” plants. Many plants of the genus Ficus have very peculiar habits. Their seeds germinate high, in the canopy, for instance stuck in the crack of a branch or stem, and the small plant that sprouts from them sticks to the wood and takes nutrients from the rain flowing down the stem. After a short while, long aerial roots begin to sprout from the strangler plant and reach the ground, where they take root, grow and proliferate. A sort of wooden cage forms around the host trunk and the ficus begins to receive nutrients from the soil as well, thus developing new leaves that invade the host plant. This generally results in the host tree dying because its foliage has been stifled and shaded. 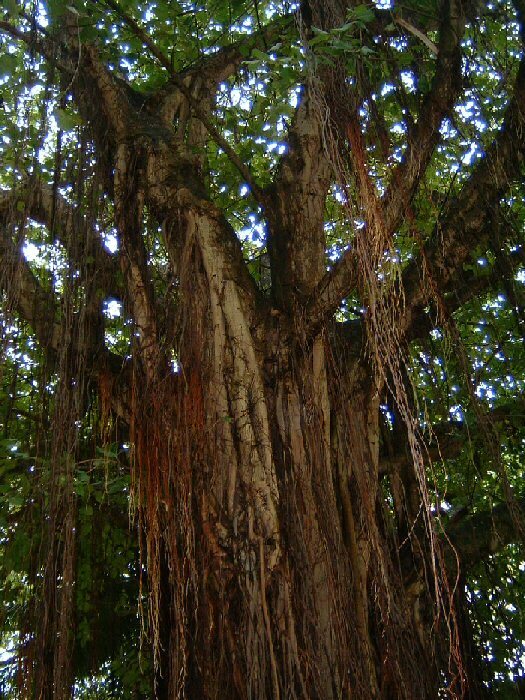 When the tree dies, the ficus fits its aerial roots into the wood of the tree, thus speeding up its decomposition.